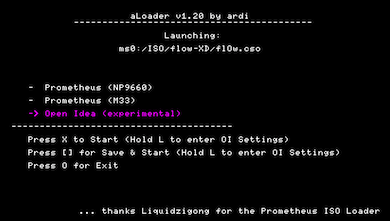 ALoader developer Ardi has released TN Xtended HEN, targeting both 6.20 OFW and 6.39 OFW. Both releases include the latest builds of Total_Noob’s HENs (6.20 TN-E and 6.39 TN-A) with an integrated ISO-Loader (aLoader). Compared to what’s on the PRO side of things (like 6.20 PRO-B7 and 6.39 PRO-B7), Ardi’s 6.20 / 6.39 TN Xtended HEN is 100% safe as it doesn’t write anything on the PSP’s flash0. The downside of that of course is that you have to run the TN Xtended installer again everytime your PSP comes from a coldboot, but hey, at least you’re 100% safe right? TN Xtended also features 3 ISO drivers: NP9660, March33 (M33), and Inferno (default) for maximum compatibility. Important Note: If you already have a HEN or LCFW loaded (like 6.20 TN-E or 6.39 PRO-B7) you will need to unload/uninstall it. How to install 6.20 / 6.39 TN Xtended HEN on your PSP? To load games, simply copy your free PSP games onto the ISO folder on the root of your PSP’s memory stick or your PSP Go’s storage. If you don’t have an ISO folder, create it.